Mock data is indispensable in front-end development process and it is the key link to separate the front-end from the back-end. Through the pre-agreed interface with the server-side, simulation request data and even logic, can make the front-end development independent, will not be blocked by the development of the server-side. 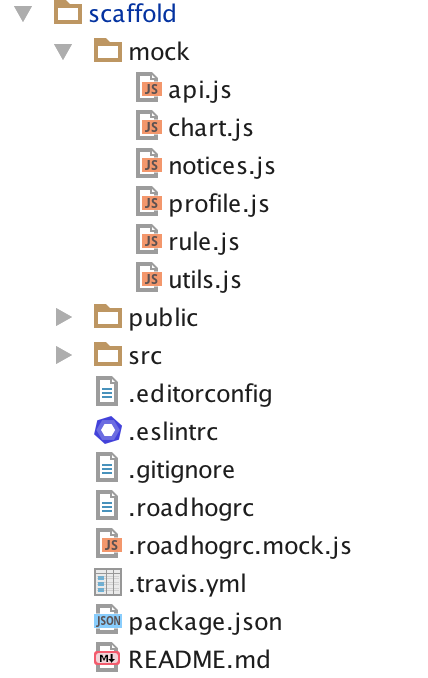 Umi agreed that the files under the mock folder or _mock.js in page(s) folder are mock files, files export interface definitions, support for real-time refresh based on 'require' dynamic analysis, support for ES6 syntax, and with friendly error messages, see mock-data for more detail. When a client(browser) sends a request, such as GET /api/users, the locally launched umi dev will match the request path and method with this configuration file, if it find a match, the request will be processed through configuration, just like the sample, you can directly return the data, or process and redirect it to another server through a function. Mock.js is a commonly used third-party library to help generate mock data. Of course, you can use any library you like working with roadhog to build data simulation functions. For the entire system, the request interface is complex and numerous, in order to handle a large number of mock request scenarios, we usually abstract each data model into a file, and put them all in the mock folder. And then they will be automatically introduced. In order to simulate the network data request more realistically, it is necessary to simulate network delay time in most cases. Although the method above is simple, it may be troublesome when you need to add delays for all request, it can be simplified by a third-party plugin，such as roadhog-api-doc#delay . If you want to generate dynamic mock data on every request, you should use functions. After finishing the local development, if the interface of server-side meets the previous convention, you only need to open the local proxy or redirect the proxy to the target server to access the real server data, which is very convenient.